Last season I continually started Sam Bradford as my QB on my fantasy football team and each week he proved that I was an idiot for instilling my faith in him. That’s fantasy football though. Sometimes you get blindsided by the promise of the offense and fail to see the ineptitude of not only the player but the entire team. So when the Philadelphia Eagles decided to sign Bradford in the offseason to a two year deal worth a guaranteed $22 million, many like myself thought they were insane. He proved for the entire 2015 season that he’s an average starting QB at best. The Eagles eventually came to their senses after he signed that contract and they went ahead and traded multiple picks to the Cleveland Browns so that they could move up in the Draft and take North Dakota quarterback Carson Wentz. Now Bradford is complaining and expressing his displeasure with the situation. Unreal. Here’s an idea Sam- Play better! When the Green Bay Packers drafted Aaron Rodgers, Brett Favre never said a word. He was confident in his talent and kept Rodgers on the bench until Green Bay was forced to decide on the young gun slinger vs. the aging veteran. Bradford on the other hand complains because he knows the organization mortgaged the future for a strong armed, no nonsense rookie that will be looking to take his job from day one. Sam Bradford needs to grow a set and show up with the mentality that he’s going to keep Wentz on the bench for as long as he can. You signed the contract Sam. Now live up to it. My buddy Jim texted me today with the news that my beloved Browns traded the second overall pick in next week’s NFL Draft to the Eagles. He wasn’t pleased. I, on the other hand, was thrilled once I heard the details of the deal. The specifics include the Browns getting this year’s #8 pick along with a 3rd round and 4th round pick. They also acquired the Eagles 1st round pick next year and a second round pick in 2018. I’d say that’a nice haul for a team in desperate need of a ton of help. The Browns have been in “rebuilding mode” since they returned to Cleveland in 1999 and this trade will hopefully be what propels them to actually start on the foundation of that rebuild. I was hoping Carson Wentz was going to be the selection if the Browns stayed at #2 but with the Rams jumping ahead of them it assured that one of the two top QBs were going to be selected before them. That put a lot of pressure on teams like the Eagles and 49ers to really consider trading with the Browns if they were in love with both QBs. The Eagles apparently are. This trade, like all others, will be evaluated a few years from now to see who made out. If the Browns blow their selections like those of years past then this trade will be another crack in the never ending “rebuild.” I for one think it’s the beginning of a concrete footer. You gotta believe! The NFL Draft is only a month away and that means the Browns are once again thinking QB. It seems to be a yearly event if you’re a Browns fan. Tim Couch, Brady Quinn, Brandon Weeden, and Johnny Manziel are the most recognizable names in a long line of failed quarterbacks that have suited it up on the north coast. With Johnny Manziel completely imploding over the last few months, it’s time the Browns cut ties and look to draft their QB of the future. Is it Carson Wentz or Jared Goff? I gotta admit, I haven’t seen either one of them play in an actual game. However, the size and mobility of Wentz should definitely be a key factor in the decision. I think I speak for Browns fans everywhere when I say that I’m tired of watching small and/or slow quarterbacks try and compensate for their deficiencies. Johnny Manziel should be the poster boy for why you don’t take a QB that is shorter than 6 foot. Note to all GMs: Stop thinking you’ll find the next Drew Brees. It’s time the Browns draft a viable option at QB (that doesn’t have a drinking problem) and put all of their resources into developing him into the best quarterback possible. Trusting Hue Jackson in this endeavor is the first step. Trusting the quarterback, whomever it may be, is the next. I know I’m fully on board! Go Browns.! Being invited to a fantasy football draft isn’t all that odd of an occurrence for me. Being invited to a fantasy football draft held by cops of the NYPD, now that’s something that doesn’t happen every day. So when I received an email from Avi, a police officer here in Brooklyn, I jumped at the chance. After all, it was a great excuse to have a few beers and scout how my draft might go down a few days later in Cleveland. Plus it was awesome to hear from the guys of the league on how they liked their trophy, The Armchair Cop. You see, Avi was the one that contacted me about designing a fantasy football trophy specifically for police officers. He had seen the couple of trophies that I did for firefighters and he was hoping I could do the same for them. I was all for it but only under one condition. I wanted them to help in the design. Avi and a few of the guys came to my shop and gave their input. From handcuffs to old school aviator glasses and a 70’s mustache, they were all included. The shoulder holster was my idea. The legendary character Fish from “Barney Miller” provided the inspiration. Anyway, the trophy turned out great, if I must say so myself, and it holds a special place in the history of FantasyTrophies.com. 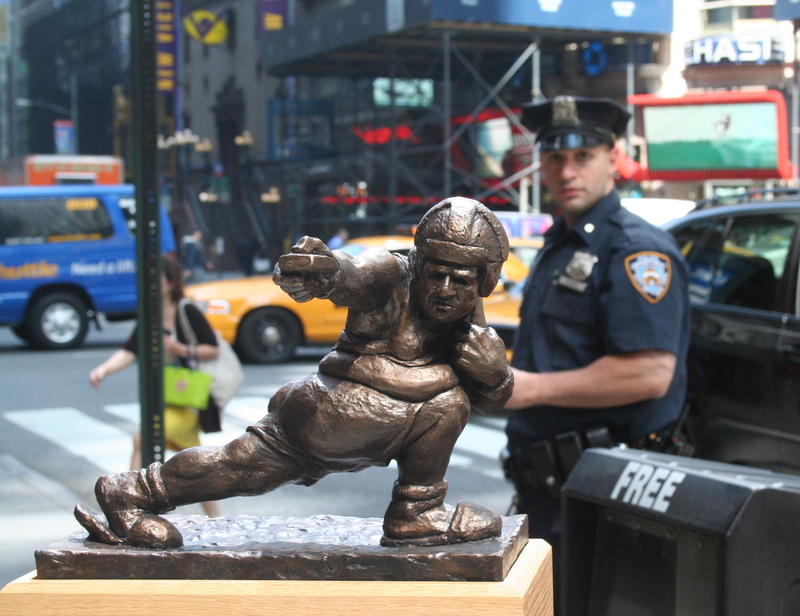 Soon it’s going to be up on the site and precincts all over the country will hopefully see the “charm” in playing for a trophy designed specifically for them, by them. Just hanging out with Brooklyn’s finest. As I sit in a campground in Moab, Utah, getting ready to skydive, I, for some bizarre reason, started thinking about how FantasyTrophies.com came to be. 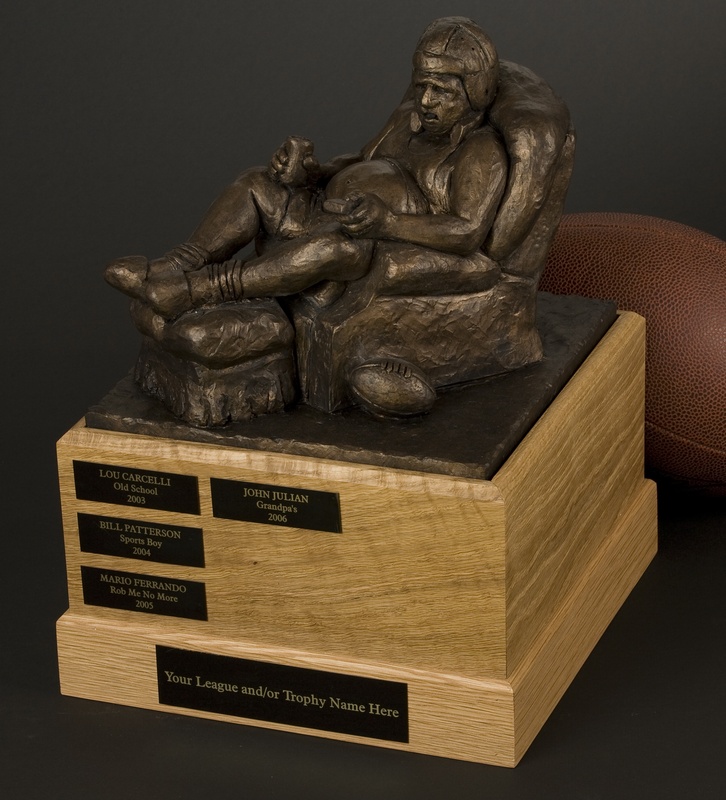 Fantasy Trophies started way back in 1993 when I was going to art school at Kent State University and decided I’d sculpt a trophy for my fantasy football league. I was taking all kinds of classes that emphasized looking at naked people all day so that I could learn about human anatomy. One of those classes was life sculpture. Even though I was a painting major, life sculpture turned out to be one of my favorite classes. Anyone that has ever taken a sculpture class knows the demands of trying to capture a likeness or the subtleties of the human form. I thrived on this challenge. 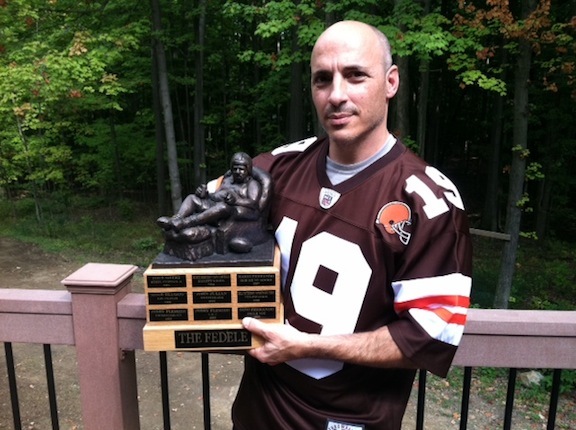 It was in this class that the idea came to me to sculpt a figure that would become my fantasy football league’s crown jewel- The Fedele Trophy. I grabbed some clay and went to work sculpting a figure based off of my cousin Johnny. Talk about an uncomfortable phone conversation when I asked him to model. My cousin was all in though and loved the idea. After some preliminary sketches, I went to work. The figure was probably completed in about a month or so and then I had to make a soft plaster mold and pour the trophy using a much harder casting plaster. After it came out I painted it and then mounted it on a pine base. Looking back now I realize what a piece of crap it was. However, that fantasy football trophy turned out to be the impetus for what would later become a business run first out of my parent’s garage and now out of a shop in Brooklyn, NY. You never know when a great idea will strike. I’m just glad I had one while going to college. One in 4 years isn’t so bad I guess. I’m not sure the idea to skydive will go down as one of those great ideas. We shall see. Photos to come later. 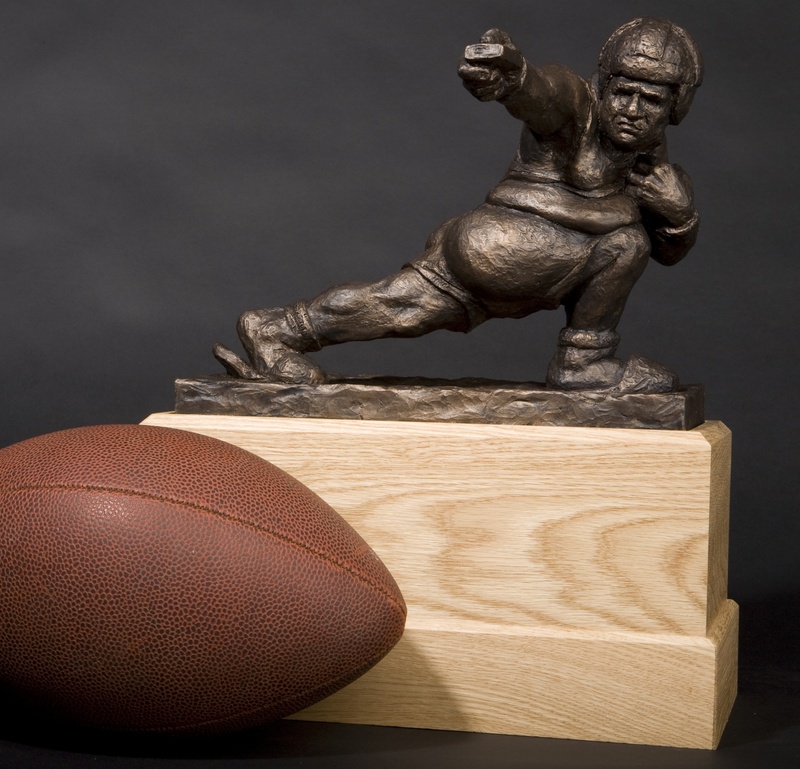 My buddy Ed over at Commishkit.com and I teamed up to run a contest that offers a FREE Armchair Quarterback Mini trophy. 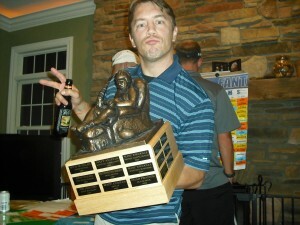 The league that sends Ed the best photo of their league with one of his draft boards will take home the prize. Just to be clear– it’s the trophy, not the girl. Since the TV show, “The League” has been on air and gained incredible popularity I can’t help but wonder if the increase in sales I’ve seen is in some way related to the “Shiva Trophy.” If you’re not familiar with the television show it’s about a group of fantasy football fanatics who eat, drink, and sleep fantasy football. They play for a trophy called “The Shiva” which is named after a girl the characters liked in high school. The trophy even has a photograph of her as part of the overall design. I gotta say, the show is a bit corny for me and I never really got into watching it. 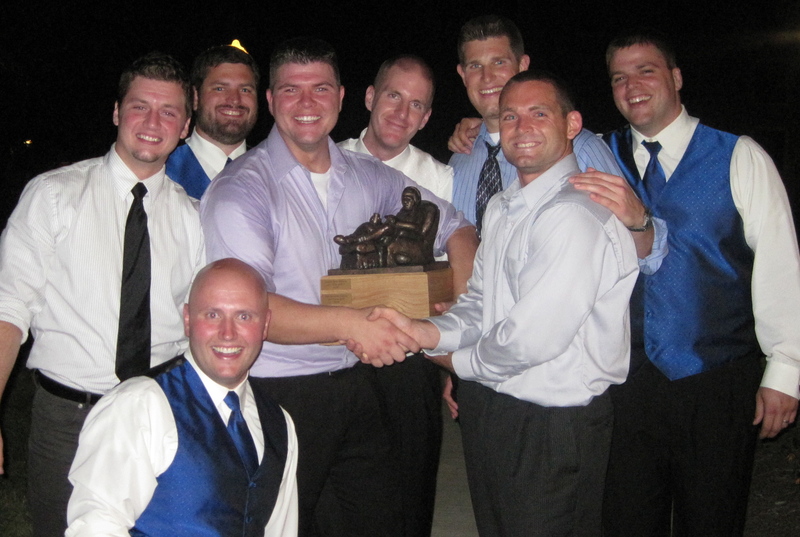 However, I definitely want to thank the writers for including the idea of playing for a fantasy football trophy. It no doubt has helped to plant a seed in the head’s of commissioners all over the country that playing for more than just cash is the way to go. Maybe I’ll have to give the show another shot as a show of gratitude. Which Fantasy Football Trophy Should I Buy? If you’re in a league where guys are scattered all over the country and you’ll be shipping it every year- I’d go with the Armchair Quarterback. It’s just less likely to break in transport. The Throwback has been known to occasionally break if it’s not packaged correctly and even sometimes when it is. And let’s face it- do you really trust that one buddy of yours to package it correctly? If the Throwback does break it ends up costing you $275 for just the sculpture top. The Armchair Quarterback can still chip or break but it rarely does if packaged the right way. It just has less fragile parts. Either way you’re clearly getting what I believe is the greatest fantasy football trophies in the world today but choose wisely. 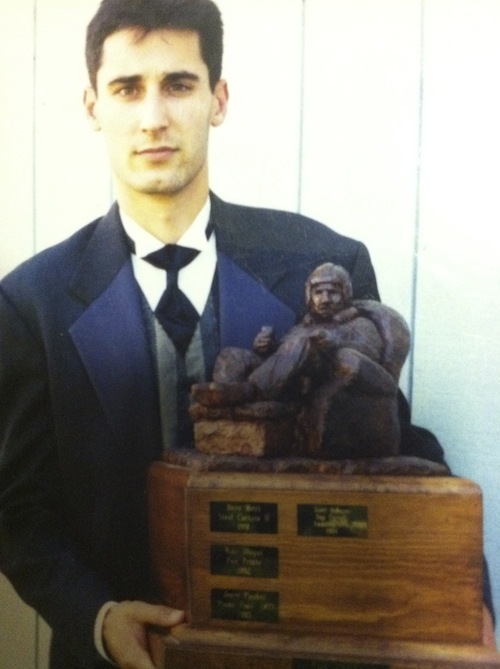 After all, soon your trophy will have it’s own history and hopefully it won’t include how your drunk friend thought his crumpled up sports page would be sufficient enough to wrap it in for its cross country journey. It’s been pretty hectic at FantasyTrophies.com lately. Mainly because I recently decided to take part in the Fantasy Football Fest in Atlantic City. Even though it’s not until August 18th and 19th, I’ve had to start building the backdrop for my booth along with putting together some material to handout. Make sure if you’re planning on going you stop by and say hello. Maybe your league will be represented in the pages of the magazine come fall!